A great way to see the impact of the SOF is to create a difference volume using Volume Maths. The difference volume, or noise model, shows the removed artifacts and highlights the impact of different SOF and dip parameters. Create a new Structurally-Oriented Filter (SOF) process from the Control Panel > Process tab. A dip field volume can be generated from the dip field process. To fine-tune results, adjust the Dip Field and Structurally-Oriented Filter (SOF) process parameters. In some cases, you can improve the detail of faults by using a median filter. To do this, set the “Percentage to retain” value of the filter to 1. Try different values to optimise your results. 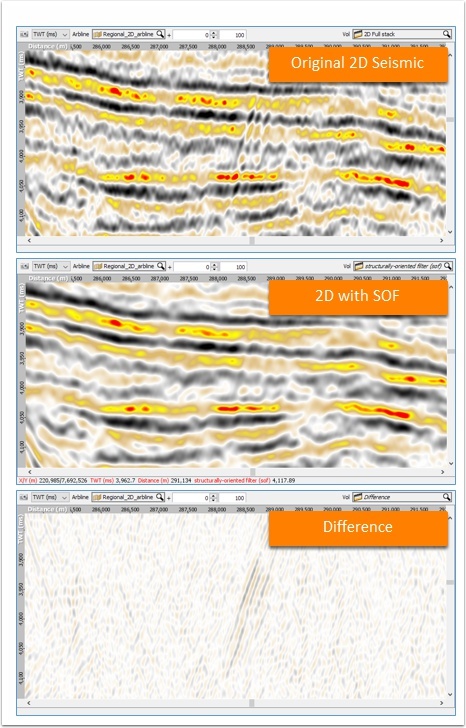 The example below shows a portion of a 2D seismic line before and after applying the SOF process, and a difference model. Notice the bright amplitudes removed in the difference coincide with incoherent areas on events in the original volume. Applying the SOF to a volume helps increase event continuity, which can improve horizon propagation performance. The seed horizon shown in the first image is mapped on a 50 x 50 IL/CL grid. In the next image, this horizon is propagated on a 3D full-stack volume prior to applying the SOF. In the last image, the same 50 x 50 grid is propagated on the SOF volume and shows more complete coverage. With the SOF, adding interpretation using the horizon propagator can be completed more quickly as larger swaths can be covered with each iteration. 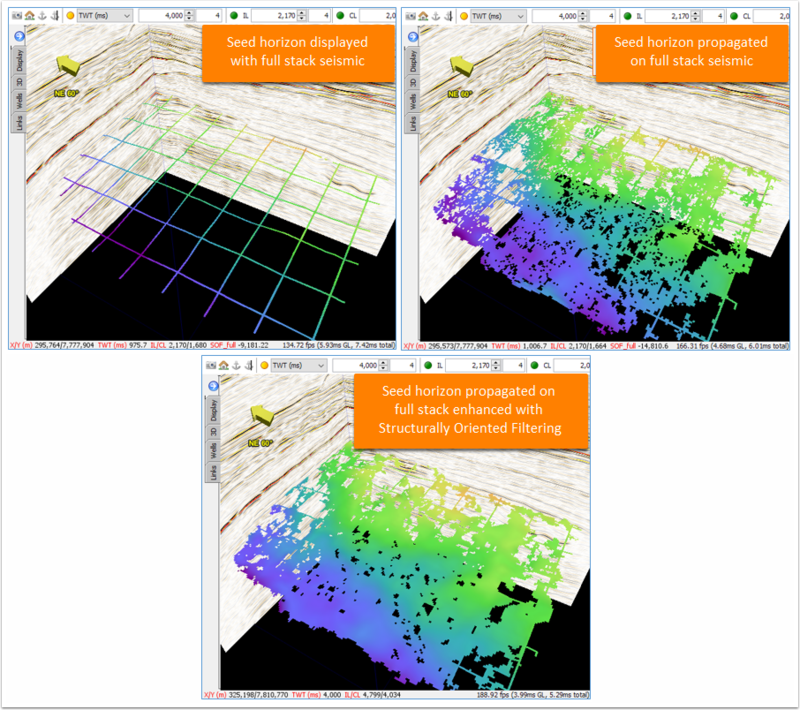 Whether you’re tidying up a post stack image or conditioning your 2D or 3D data for horizon interpretation, the SOF can help enhance your data. Greater event continuity created by the SOF improves the interpreter’s ability to pick the proper event when manually picking, and allows for fewer iterations of the horizon propagator to be used when expanding the interpretation off of the seed grid. Since the SOF takes into account event dip, it can enhance the seismic image while preserving the structure shown in the original data.